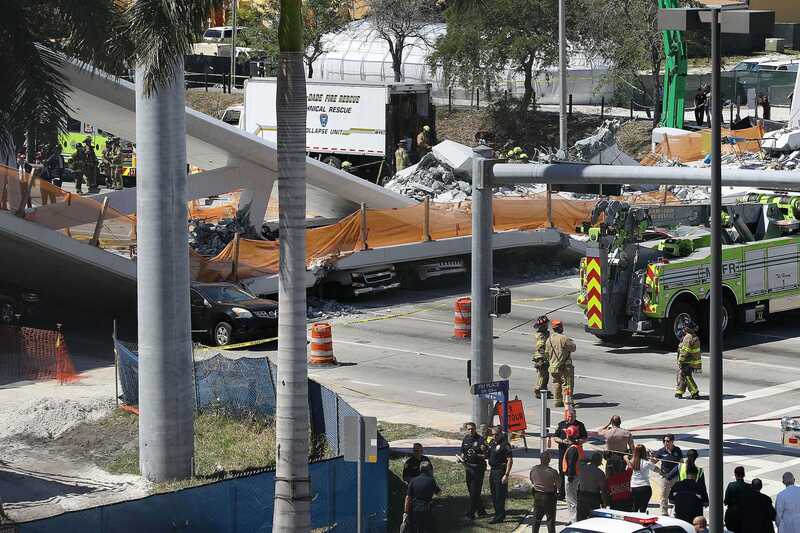 The pedestrian bridge that collapsed in Miami, Florida, on Thursday was installed using the Accelerated Bridge Construction method. Local and federal officials are now investigating the cause of the collapse, but it could take days to find out what happened. At least six people are dead and recovery efforts are ongoing, though police said Friday they don’t expect to find survivors. The pedestrian bridge that collapsed and killed at least six people in Miami on Thursday was installed just days earlier using an innovative technique to speed up construction and minimize traffic disruption. The $14.2 million bridge spanned 174 feet and weighed 950 tons, and took just “a few hours” to install on Saturday, according to a press release from the Florida International University, where the bridge connected with the city of Sweetwater. The university lauded the project as a major improvement to students’ safety, a “construction marvel,” and an “outstanding example” of a method called Accelerated Bridge Construction. Saturday’s installation also set a record for the largest bridge to be moved using self-propelled modular transportation in US history. But FIU officials’ triumph was short-lived. Soon after the deadly collapse, the university deleted a tweet about the bridge that quoted its president, Mark Rosenberg. “FIU is about building bridges and student safety. This project accomplishes our mission beautifully,” Rosenberg said. Experts say the FIU bridge is far from the only one to use the ABC method — it’s been gaining popularity across the US for the last 10 years. “It’s more expensive to do, but it gains the advantage of keeping traffic moving and that’s what makes the phone ring at the mayor’s office,” Ralph Verrastro, president of the Naples-based Bridging Solutions, told The Miami Herald. The method is a “very good way to construct our bridges,” Andy Hermann, a former president of the American Society of Civil Engineers, told ABC News. He added that it’s unclear whether the use of the ABC method caused the Thursday’s disaster. “It could be materials, it could be construction technique, it could be the engineering design itself,” Hermann said. The bridge was also being stress-tested by construction workers at the very moment it collapsed, The Herald reported. 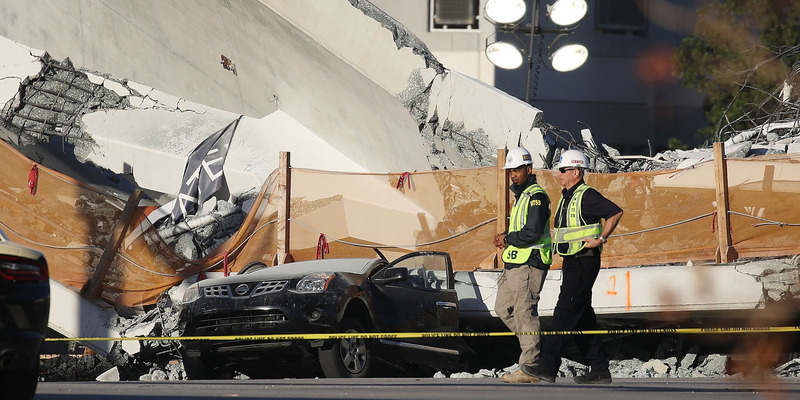 Federal and Miami-Dade officials stressed to reporters during a Friday morning press conference that their investigation is only just beginning, and it will likely take days to determine the cause of the collapse. The National Transportation Safety Board sent a 15-member “go team” to the scene on Thursday, and is investigating both how the bridge collapsed and how the incident could have been prevented. “Our entire purpose for being here is to find out what happened so that we can keep it from happening again,” NTSB Chairman Robert Sumwalt said. ← Half A Dozen Mustang Drivers Crash Into Each Other After Leaving Dubai Car Meet!